At CCRPC, we are committed to our region’s water. Water is needed for human life and health, agriculture, and industry. We use it in our homes, in our businesses, in our recreation. And because water is necessary, planning for water is necessary. In June 2014, a 12-member advisory panel was convened to help develop the Regional Water Supply Framework report. The advisory panel included representatives from Champaign County, the City of Champaign, the City of Urbana, the Village of Savoy, the Village of Rantoul, the Village of Mahomet, the Champaign County Farm Bureau, the Champaign County Soil & Water Conservation District, Illinois American Water, the Illinois Sustainable Technology Center, and the Urbana-Champaign Sanitary District. Facilitated by Champaign County Regional Planning Commission staff, the advisory panel met on a monthly basis for approximately one year, between October 2014 and October 2015; meetings were a combination of discussions and presentations on water topics. The meeting discussions generated the four general recommendations and 36 strategies of the Regional Water Supply Framework report approved by the RPC Board of Commissioners on October 28, 2016. The report is intended to serve as a flexible water planning framework, with a scope largely limited to Champaign County. However, water systems cross jurisdictional boundaries, and it is impossible to consider the conditions of water quality and water quantity in Champaign County without also considering conditions elsewhere in East Central Illinois. Furthermore, the concerns that led to the development of the report and its goals and strategies are applicable on a regional scale. The Regional Water Supply Framework report offers a range of strategies in the spheres of research, policy, and outreach. These strategies will benefit and help protect water quality and water quantity, and they can be addressed by a variety of actors, from municipal governments and utilities to individual residents and small businesses, acting collaboratively or individually. 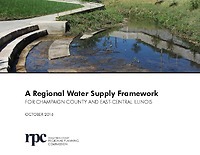 CCRPC hopes that this report can act as the basis and the inspiration for planning and implementing plans about water issues in Champaign County, East Central Illinois, and greater Midwest region.